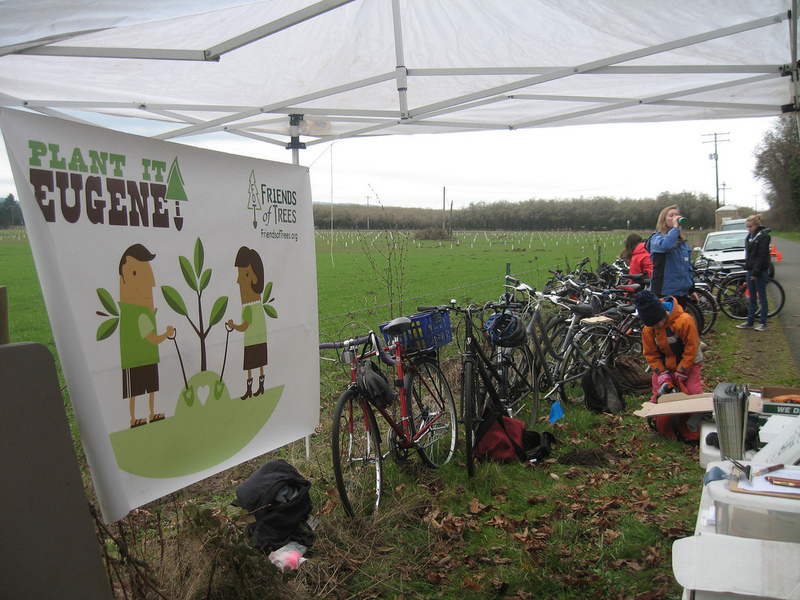 Plant trees by bike Saturday December 2nd and Saturday December 16th with Friends of Trees! We are also looking for volunteers that have bike trailers and would like to help haul trees and tools by bike. Gloves, tools, and refreshments provided! We are looking for tree planters, bike team members, and truck drivers! Check out Events Calendar for more details. The City of Eugene seeks residents who are interested in serving on the Active Transportation Committee (ATC), formerly Bicycle and Pedestrian Advisory Committee. Recruitment is underway to fill vacancies for two year terms beginning January 2017. Applicants must reside within Eugene’s Urban Growth Boundary and willing to attend monthly meetings and read background materials provided by city staff. Additional meetings may be scheduled as needed. The purpose of the ATC is: (1) to advise the City of Eugene staff and community organizations and partners on implementation of Eugene’s Pedestrian and Bicycle Strategic Plan; (2) to represent community and constituent interests in transportation planning decisions; and, (3) to provide feedback to staff on projects relating to walking and bicycling. ATC members play a vital role in implementing walking and biking projects in the Transportation System Plan which will shape the future of the pedestrian and bicycling system for the next 20 years and make Eugene an even greater place for people who walk and bicycle. Applications are available online via the City of Eugene website at http://www.eugene-or.gov/490/Committees, by e-mail at lee.shoemaker@ci.eugene.or.us, or by picking up an application at City of Eugene Engineering, 99 E. Broadway, Suite 400, Eugene. The deadline for submitting applications is November 25, 2016. For more information, contact Bicycle and Pedestrian Coordinator Lee Shoemaker at 682-5471 or lee.shoemaker@ci.eugene.or.us. If you are pumped on biking and want to bring your bike out to a planting event – we would love that! Bicycling crews transport all of the trees, tools and people to each planting site during neighborhood planting events. Folks with bike trailers and racks are encouraged, though anyone with a bike is welcome to plant with us! Friends of Trees provides trained planting guidance as well as a thoughtful planting route that won’t take you up steep hills, along busy highways, nor terribly long distances with your heavy loads of trees and tools. After every planting, we invite you to warm up at our potluck lunch with tasty soups and other homemade treats. Last year we had a bike team at every planting and this year we plan on having two! I am here to invite you all, to bask in the awesomeness of pedal-powered tree-planting with Friends of Trees! With our first bike event taking place one month from now in November, I wanted to make sure you all got our schedule of events sooner than later. Trailers, bungees, panniers, oh my! Bike planters always are an awesome scene, come planting morning. If you have friends who may want to join you by bike this season – please invite them and send them the sign-up link! We are hoping to have more planting teams this season than ever before. The more bikes and trailers that show up, the better! Please reach out to us if you have any questions about biking at our events, or volunteering with Friends of Trees in general. You may reach us at Eugenetrees@FriendsofTrees.org or 541-632-3683. If you like digging out blackberries, you’re in luck! WeBikeEugene was contacted by the Walama Restoration Project, asking that we invite our readers to a volunteer work party from 10 a.m.-1 p.m. Saturday (Feb. 20) to help with an ongoing effort to rehabilitate and revegetate the Whilamut Natural Area along the North Bank Path (just north of Knickerbocker Bridge). Members of Walama Restoration Project and volunteers will meet at the site in East Alton Baker Park to hand-pull small weeds and dig out himalayan blackberries. WRP is working to reclaim native prairie habitat along the Willamette River to boost local biodiversity, improve forage for native pollinator species and help preserve the Willamette Valley’s biological legacy. If you can’t make this one, WRP plans more work parties throughout the year.